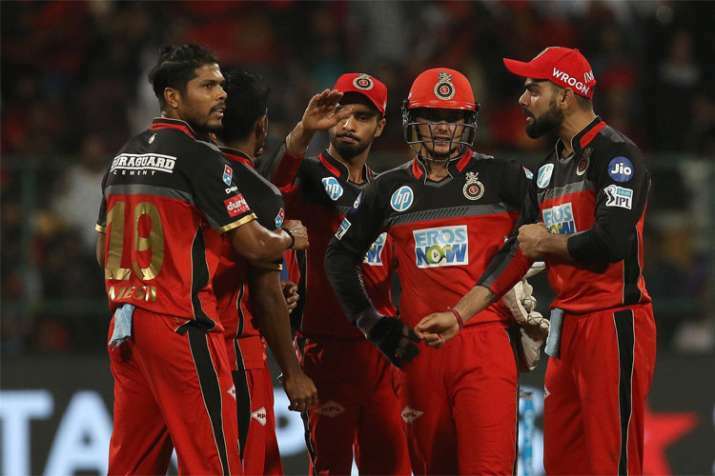 Royal Challengers Bangalore's recent loss against Kolkata Knight Riders has jeopardised their campaign in the ongoing 11th edition of the IPL. Captain Virat Kohli said RCB need to consider every match as a virtual semi-final from now. RCB slumped to their fifth defeat in seven games after failing to defend 176 against KKR on Sunday. "If we look back, we didn't deserve to win. I don't think we're trying hard enough, we need to be hard on ourselves. We don't deserve to win if we field like that. We can't afford to field like that and let singles go to boundaries. We were just not good enough tonight," Kohli said after the match. If RCB lose their next match, they would put themselves in a precarious situation of winning all remaining games, out of which four are away games. Kohli said they need to consider every match as a virtual semi-final from now. "I can't pin point anything right now, we need to win six out of seven to qualify from here. We need to be in that mindset to take every match as as virtual semi-final from now," he said. "There's no room for lapses, complacency or hesitation. We need our guys stepping up and hopefully the guys can put up a better show." Brendon McCullum said it was a big blow for Royal Challengers Bangalore to miss the services of AB de Villiers in the crucial match against Kolkata Knight Riders. "We definitely missed AB de Villiers. He is probably the best player in the world and one of the best we have seen in the history of the game, so for him to be absent was a huge blow for us. "He is a tough customer as well, so obviously he is pretty ill to not take the field today," he told reporters in the post-match press conference. McCullum hoped that de villiers returns in the next match against Mumbai Indians after recovering from a viral infection. "He is desperate to get out there, so hopefully he will be back in the next game. He is such a key player for us, and such a good leader. A good man to have around," he added. Asked whether KKR were happy not to find de Villiers in the playing list, man-of-the-match Chris Lynn said: "Yeah, it is obviously a couple of smiles on the bowler's faces. "We know AB, in the form he is, is always a dangerous batsman but we could not take the foot off the throat because Baz (Brendon McCullum) is such a good striker of the ball. [We had] a little half-smile but we knew we still had a job at hand," Lynn said.